Cod au Gratin is a traditional Newfoundland dish with the star ingredient being, of course, cod! There’s a lovely little béchamel or white sauce covering the cod and then it’s topped with cheese and breadcrumbs (or in this case croissant crumbs….eeeek – YUM!) and all baked in the oven until it’s nice, bubbly and brown. Hey guys; how’s it going? Have a nice weekend? Ours was great – the weather was lovely so we had a chance to sit on the deck after doing some yard work and have a beverage. It’s not exactly hot, but the sun was shining so I’ll take it! I think there’s a bird nest around us somewhere because we have more birds hanging around than usual. There’s this one little fella and he sits on the railing of our deck and just chills; he has visited multiple times and I can guarantee you one thing, he is eating well! Little guy is so big! I just love seeing them around. We had some good eats this weekend, too. It was so funny….wondering what we were going to have for supper on Sunday I said to hubby ‘ I have a mad craving for cauliflower.’ He just did a double take and looked and me and said ‘I think that just may be the un-coolest thing you have ever said.’ That’s ok; I’m comfortable with who I am, lol 😛 That’s ok, I’m comfortable with who I am! What can I say, I love cauliflower. So what’s this ‘Traditional Newfoundland Cod au Gratin’ dish all about, you ask? Well, cod is the fish in Newfoundland. And Cod Au Gratin is among the most popular traditional dishes of the Province, without a doubt. You can find this dish made at some time or another in practically everyone’s home in Newfoundland. I’d say a 5 year old could probably make this one with their eyes closed it’s that common. Ok, not really, but you get what I’m saying. My Mother-in-law gave me these beautiful frozen cod fillets and they went to good use in this dish. Au gratin anything is never a bad thing, is it? I mean, cheese covered whatever and baked? Sign me up! I like to add dill and lemon to my recipe. Not everyone’s version of Cod au Gratin has dill, but I love to add it because seafood and dill go hand and hand…just like dill and lemon or me and cupcakes 😀 It’s a definite seafood classic combo. A little twist that I like to do, too, just to take it one step further is to add lemon zest to the sauce. I find that the freshness of the lemon and dill really brighten the dish. If using cod that has been previously frozen, pre-cook in casserole dish and lay to one side. Cook onion on the stove top until softened. In a pot, make roux (flour/butter mixture to thicken sauce). Add milk to roux, cook until thickened a little, and season with salt, pepper, lemon zest and dill. Pour sauce mixture over cod, top with cheese and bread crumbs. Let cool slightly and garnish with additional dill. Can you use frozen fish in cod au gratin? Absolutely! That’s exactly what I used (though fresh works too). If using frozen cod fillets, pre-cook a little to get rid of excess moisture. I find that cod, in particular, when frozen, releases a lot of moisture when cooked. By pre-cooking the cod, it gets rid of excess moisture so that lovely creamy béchamel sauce you have made doesn’t get watered down. If you are using fresh cod, you don’t have to pre-cook before baking the cod au gratin. Croissant bread crumbs were used in this recipe, but bread crumbs would work lovely too. Want an even richer sauce? Use one cup of milk and one cup of half and half instead of two cups of milk. Heavy cream can also be used instead of half and half if you are going all out! 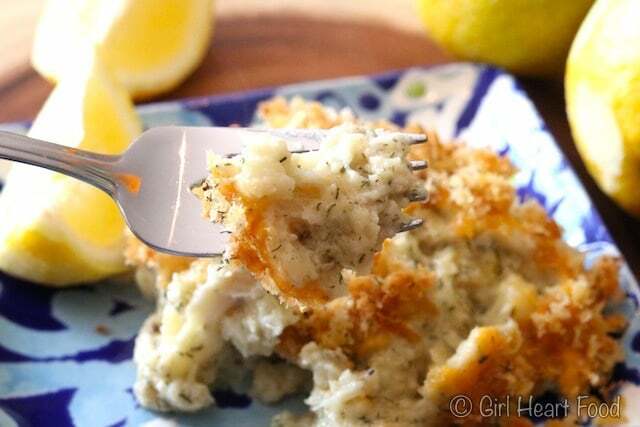 Dill was used in this cod au gratin and it works so lovely with the fish. If you rather not use it, you can omit (but I highly recommend it). Let the cod au gratin cool for a little after it’s baked before digging in. Like most recipes, this is best enjoyed when it’s baked. 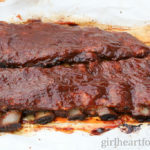 However, in a pinch you could easily make ahead and reheat when you are ready. Keep in mind, though, it may be a little less moist if reheating. What to Serve with Cod au Gratin? Lemon wedges are highly recommended. Hot sauce dabbled over top adds a little somethin’. A thick slice of homemade bread. My favourite? Bread slathered in butter and drizzled with molasses. Trust me. It works with the cod au gratin. 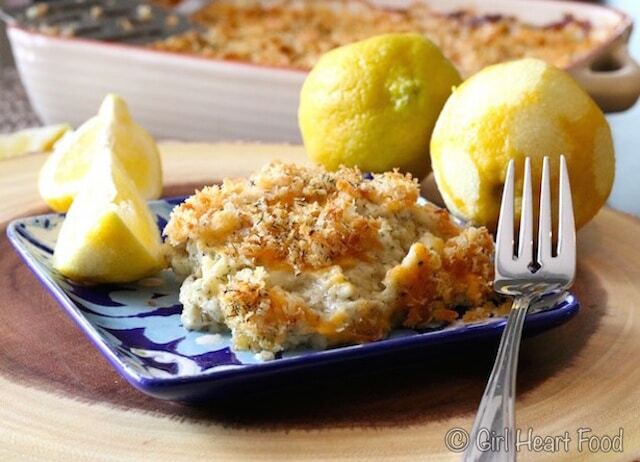 Can Cod au Gratin be Served as an Appetizer? Yes! Cod au gratin works as an appetizer as part of a multi course meal. Of course, it’s substantial enough to easily be a meal in itself. For this recipe, I made in one big dish. However, for presentation purposes it really looks nice cooked and served in little individual dishes. This recipe yields about 4 servings for dinner or 6 appetizer servings. It’s lovely for dinner with a simple garden salad and leftovers reheat well, so you can totally make ahead if you like. Hope you get a chance to try this Traditional Newfoundland Cod au Gratin recipe that is an iconic dish of where I am from. If you do get a chance to try, I’d love to hear how you like it! Oh, and if you’d like to try another Newfoundland recipe, you may enjoy these salt cod fish cakes. P.S. If you think this Cod au Gratin recipe will make your belly happy too, please be sure to hit that little Pin button. Many thanks, you guys! In a small pot on stovetop heat milk on low. Preheat oven to 375F. Place cod in casserole dish and sprinkle with 1/4 tsp of salt. Lay to one side until you make the sauce. See note below if using cod fillets that have been previously frozen, as in my case. Meanwhile, in another pot on stovetop, add 1 tbsp. of olive oil. Heat on medium low. Add onion and cook until softened and translucent, about 5 minutes. To onion, add butter; melt. Add flour and stir to form a paste. Stirring, cook for about 3-5 minutes. Slowly add milk to this (cup at a time), stirring until thickened about 2-3 minutes. Sauce mixture should coat back of a spoon. Mixture will be thick. To sauce mixture, add remaining salt, pepper, lemon zest and 1.5 tsp of dill. Stir to combine. Pour sauce mixture over cod, coating all fish. Stir to ensure mixture is incorporated well. Add cheese and croissant crumbs on top of sauced fish mixture. Bake for 40 minutes until brown and bubbly. Sprinkle remaining 1/4 tsp of dried dill over top. Let cool about 20 minutes before serving. Serve with lemon wedges. Enjoy! If you are using frozen cod fillets (like I did), I recommend thawing and precooking a little to remove excess moisture. Preheat oven to 350F and place cod fillets in baking dish and cook for about 25 minutes. Carefully remove from oven, drain any excess liquid and tear the pieces of cod a little to break up. Continue with recipe. This is not necessary, but I find that it works well because you don't want the sauce to be watered down and runny. This looks delicious! I plan to make this for a Canadian Theme dinner with a group of friends. I will double the recipe. Do you think I can put it together a day ahead and bake just before serving, or will it get watery? Thanks Chris! I think that would be a-ok 🙂 Hope you enjoy it! Thanks, Dawn! I made this a day ahead, adding the breadcrumbs just before baking. It worked out great! Loved all the lemon and dill in this dish. Thanks for sharing this excellent recipe. What a delicious dish! I’ve never had cod like this but I can’t wait to try it! Thanks Shadi! It’s quite popular around here 🙂 Hope you get a chance to try it out! Mmmm. I fell in love with cod when on my honeymoon in Spain, but never thought to turn it into a gratin. Sounds like the perfect easy comfort food recipe. Yum! It’s so popular around here and definitely a favourite! Hope you get a chance to try this one out 🙂 Thanks Leslie!